Gweta is a small little village 205 km outside Botswana’s tourism capital, Maun and 100 km from Botswana’s transport capital, Nata. Although Gweta is a relatively small village, the city doesn’t let its size get in the way of greatness. It is considered to be the gateway to the gigantic Makgadikgadi pans and has become renowned for its monumental Baobabs and being in proximity to the second largest migration of wildlife in the world. Gweta’s famous Baobab Trees are some of the largest in the world. In fact they are so large that they have become national monuments. Awe-inspiring due to the sheer enormousness of the plants they are worth taking a look at. One of the biggest attraction in Gweta is Greens Baobab which is located just 27 kilometres south of Gweta. This Baobab Tree was inscribed hundreds of years ago by some of South Africa’s most famous hunters, traders and explorers including Fredrick Thomas Green whose inscription can be seen still be seen on the plants bark today. 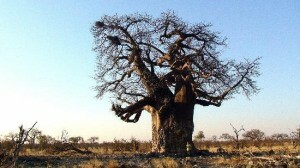 Only 11 kilometres south of that, is the location of the largest Baobab with a circumference of an astounding 25 meters. 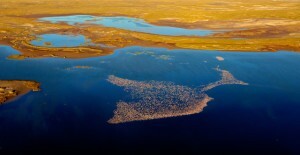 The city of Gweta is generally known as the gateway to the huge expanse of the Makgadikgadi Pans. Not only is the Makgadikgadi Pans home to an unbelievable variety of birdlife and an astounding antelope population but mixed among the thousands of pink and white flamingos and the second largest surviving heard of wildebeest and zebra, during the rainy season thousands of bullfrogs make this home and can be heard croaking for miles away. In fact, this croaking is such a big feature of the pans that the city of Gweta was actually named after the sound of these frogs croaking. As Gweta is the gateway to the Makgadikgadi pans, visitors can enjoy the breath-taking event of the wet season migration. Here between 35 000 to 75 000 wildebeest and zebra migrate across the dry saline plains, creating an unbelievable site of natural at its best. This migration is the second largest in the world and the zebra and wildebeest population is the second largest surviving herd in Southern Africa. It also becomes home to that live, eat and breed in the waters. Some of the stones from the pans date back from 2000 to 50 000 years ago.